Peter Theil had dinner with President Trump on Tuesday. Theil took as his guest Oracle CEO Safra Catz. 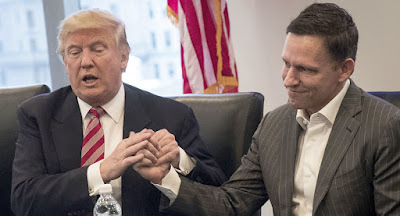 Catz pitched Trump on the U.S. government using Oracle 's computer servives instead of Amazon 's. This is called switching the crony horse, not ending cronyism. Maybe it's called "competition" as opposed to "cronyism." If Oracle's systems are cheaper to use and more effective than Amazon's, by all means make a change. I don't care what "crony" benefits in the end, as long as overall it benefits the US taxpayer more so than the status quo. So when has that ever been a concern? They will make up and more any 'savings' to the taxpayer through some other spending. Yeah, when it comes to the state, inefficiency and waste are about the best you can hope for. Indeed and Oracle knows this and will make bigger profits and not really "compete" with Amazon just supplant them. The Idiocrat and Chief isnt bright enough to know that.